Never mind him. The star’s the one on the right. Criminy! Does no one train waiters these days? Heavens to Betsy, Thirsty Reader, where is Craig Claiborne when we need him? 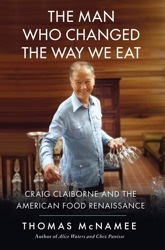 Speaking of whom, Thomas McNamnee’s just-out bio—The Man Who Changed the Way We Eat: Craig Claiborne and the American Food Renaissance—is an acquired taste at best. And it isn’t a patch on G.Y. Dryansky’s Coquilles, Calva & Crème. But of this more anon; it’s time to get on with my Father’s Day Special. So there we were at the GT, Mike talking and I [believe it] listening. Mike has that most admirable of virtues, quiet self-confidence, and so had no need to boast of his quite terrific Cabernets. Drinking them told that story. 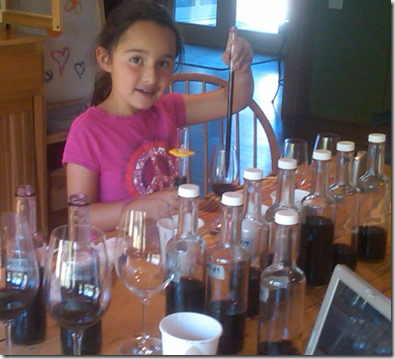 And so with all claptrap about degrees Brix, pH levels and oak regimes ruled out by common and tacit consent, Mike rhapsodized about his daughter, Sophia, who bids fair to be America’s youngest wine-taster. The story never hit print in Hemispheres because United Airlines’ stiffnecks got the blue creevies when they learnt that Sophia was four and a half years old. 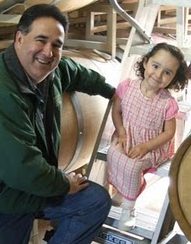 Born in La Jara, Colorado, Mike was an engineering student who one spring break dropped in on Jim Allen, a family friend and owner of Sequoia Grove. Jim put him up for a few days; Mike helped around the winery; Allen offered a job. ‘I was 21’ Mike says ‘an age when you have no clue what you really want to do, but the money was good and the weather was great, so I said yes.’ He began with planting vineyards and soon was on his way to making Chardonnay, Syrah and his nifty Cabernet blends, which range from the $34 Rebellious Red to the new Cambium, which will cost you $140 when you can get it, which isn’t often. ‘Wine found me’, he says. 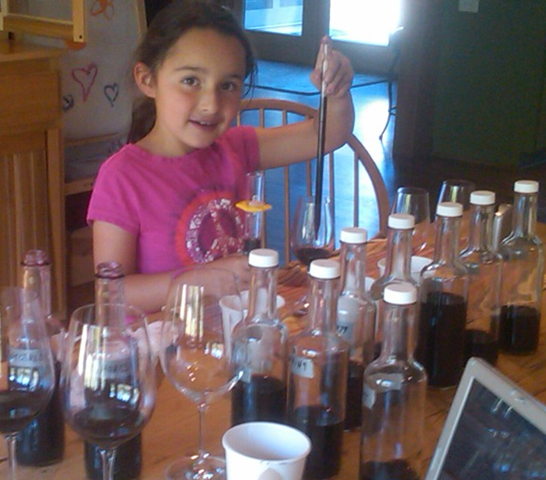 That was back in ’09; now Sophia has begun learning about blending, as Mike told me last week. She’s become a dab hand with pipette and graduated cylinder, and she has Rutherford Dust on the soles of her shoes. Excuse please, while I indulge again in my quixotic attempt to keep reading alive and on life support. Books do furnish a room, as Anthony Powell said, and minds, too. So for Father’s Day consider these . 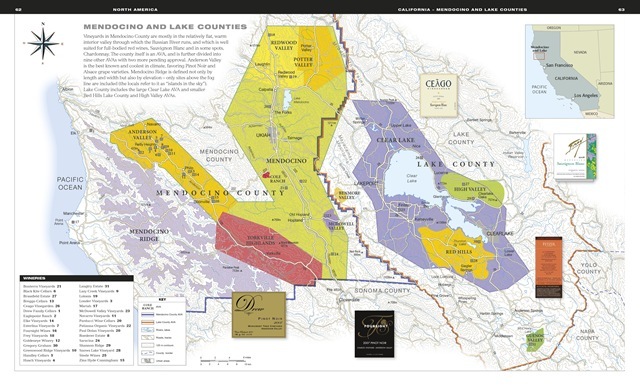 . .
All graphics all the time: DK’s Opus Vino. it’s well-organized [by country, by region, by winery] and heavy on the graphics: bottle shots, maps, mavens, labels and sprawling spreads of vineyards to lighten the many hectares of text. It’s also heavy, period; at just over seven pounds, it might require two laps. And there are contenders in the lightweight [under seven pounds] division. Jancis Robinson’s The Oxford Companion to Wine, long-established and now in its third edition, has gravitas to outweigh its ho-hum graphics: like OV, it has an impressive list of contributors; unlike OV, its individual entries are signed. 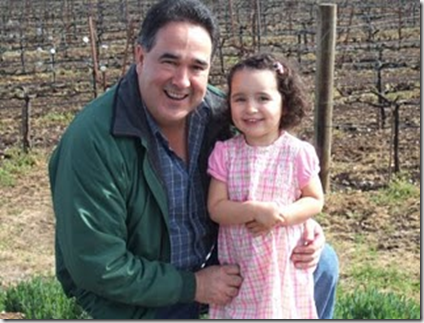 It’s organized as a dictionary, with far less attention paid to individual wineries. So you’d better buy both? Yes, and toss in a brace from John Wiley: Wine Appreciation, by the aptly named Richard P. Vine, and Exploring Wine: Completely Revised 3rd Edition, by the CIA troika of Steven Kolpan, Brian H. Smith and Michael A. Weiss. The former gets no cosmetics points for its plain-jane black-and-white approach but the latter is a handsome full-color production, nearly as heavy as OV. Another route is the contemplative narrative. It’s especially attractive to those who’d like to give Dad the trip to France he deserves but who have been scared white by airfares of oh, $1500 per person. A feasible, feastly alternative is provided by the Dryanskys, G.Y. [Gerry] and Joanne. They’ve been in France longer than most Frenchmen have, just shy of half a century, bien sûr, and their Coquilles, Calva, and Crème is a rewarding memoir in two parts. One covers Gerry’s career as a fashion correspondent and general reporter for some A-List U.S. publications; it’s full of good gossip, cool-eyed but never malicious. It’s a treat for example to know that Régine missed attending the party of the year [or decade or century] because her elephant got lost in the Bois de Boulonge; that the Duchess of Windsor wasn’t really out of line when she wet the floor of a restaurant bathroom; that Coco Chanel said of a critic she loathed ‘mouth like a sewer, talks like a sewing machine.’ The second part follows a series of locavore voyages into la france profonde, the deeply rural countryside that remains, to most Frenchmen, the heart and soul of their nation. The object? 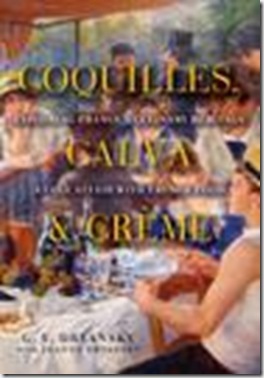 To seek out the products, places and producers of France’s traditional cuisine: lampreys and smoked eels; calva distilled the old-fashioned way [unfiltered]; some of the celebrated 246 kinds of cheese; the beouf gras of Bazas; and Billom garlic, cassoulet and Baeckeoffe. The places? Pays d’Auge, Alsace, Normandy, the Auverne and elsewhere. The people range from cheesemakers who persist despite the crushing zealotry of EU sanitation laws and cooks who’d rather work 16 hours a day almost alone than submit to the bullying big-time rat race with its ‘shrill refrain of new, new, new’. The result is a book that is truly vaut le voyage. Now then: Having dismissed McNamee’s Claiborne book at the outset, I owe some explanation, and so: the writing is what I’d wincingly call workmanlike at best and it’s too often not best at all. It’s repetitious and hagiographic; it’s unfair to Mimi Sheraton, Clementine Paddleford, John Hess and the early Gourmet; and it makes way too large a claim. Changed the way WE eat? Who the hell’s we? A vexed question. Oh, we means that ridiculously small tribe of people called foodies. Never mind about the 300 million+ Americans who put agribusiness on its throne and fast food in their bellies; who make the author’s we about the smallest since Mark Twain’s ‘kings, editors and people with tapeworms’. OK, Claiborne essentially invented restaurant criticism [in the U.S. anyway] and got food writing a much larger and more serious audience. And he was notably, even unusually generous in helping to launch the likes of Julia Child [whose influence was, I think, far greater], Marcella Hazan, Diana Kennedy and others. His personal life? It’s nightmarish for readers, so how must it have been for him? Born in the Deep South in a family for which the term shabby genteel could easily have been invented. Mom ran a boarding house but she never surrendered her airs and graces, even to her end as a Frat Row house mother. She rejected him and boys in general as filthy creatures but haunted Claiborne like a curse: he finally cut her out of his life, not even going to her funeral. Dad may/may not have molested him [Claiborne was coy here]. He was an uncloseted homosexual in an era when that took real guts, but all his affairs seem to have been uniformly doomed and unfulfilling. That he drank himself to death can be no surprise. 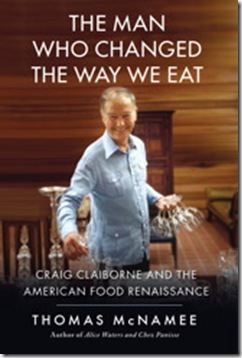 That he managed to make of himself an important figure with a positive contribution; to drag at least some of New York’s restaurants out of the Canned String Bean Era; to explore foreign cuisines before anyone’d ever heard the word ethnic; and to compile best-selling cookbooks that are still popular today? If you took that script to MGM you’d be back on the street so fast you’d think the building collapsed. By the bye, all the books can be ordered from Amazon or, of course, anywhere else. Amazon’s advantage is in used books, whose prices and availability are noted right alongside the new-book prices. Often the books are not used but overstocks or remainders, and the sellers are reliable. One of my favorite “Poured with Pleasure” issues. Loved the piece on Sophia, who is obviously a great winemaker in the making. Keep us informed. And thought your review of the Claiborne bio was dead-on. Also liked your tip about buying used books, which I have been doing for years. I look forward to reading these more than ever.